Donald Trump has now given two addresses to Joint Sessions of Congress. He has yet to use the words "Social Security" in either address. He hasn't used the word "Medicare" either. What will an adjudicator do if a claimant or representative challenges the constitutionality of the manner in which SSA appoints its ALJs? ALJs will only respond, “the hearing decision [/dismissal] will acknowledge that the argument was raised.” Because SSA lacks the authority to finally decide constitutional issues such as these. ALJs will not discuss or make any findings related to the Appointments Clause issue on the record. ALJs will not otherwise discuss or make any findings related to the Appointments Clause issue. As challenges of the constitutionality of the appointment of SSA’s ALJs are outside the purview of the administrative adjudication, the AC will not acknowledge, make findings related to, or otherwise discuss the Appointments Clause issue. .. If a claimant or representative raises an Appointments Clause issue, Office of Hearings Operations (OHO) and Office of Appellate Operations (OAO) staff will flag the case in CPMS and ARPS by adding the case characteristic “LUCI,” which can be found in both systems under the “Other” case characteristic type. 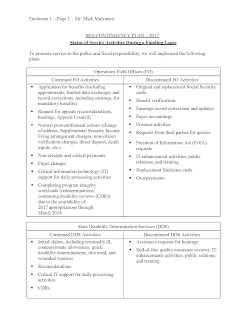 The Social Security Administration (SSA) has a need to acquire a commercial off the shelf (COTS) software product solution including software licenses, maintenance, training and engineering / implementation support, for an enterprise-level Document Identification Process (DIP) solution to identify duplicate documents in the Social Security Administration's electronic folder and provide the ability to remove those duplicate documents to support streamlining agency business processes. ... The size standard is $38.5M. ... SSA anticipates awarding one firm fixed price/Indefinite delivery indefinite quantity contract for this effort. The period of performance shall be for a 1-year base, with four 1-year option periods. ... It is anticipated that the Request for Proposal (RFP) will be issued on or about January 30, 2018. 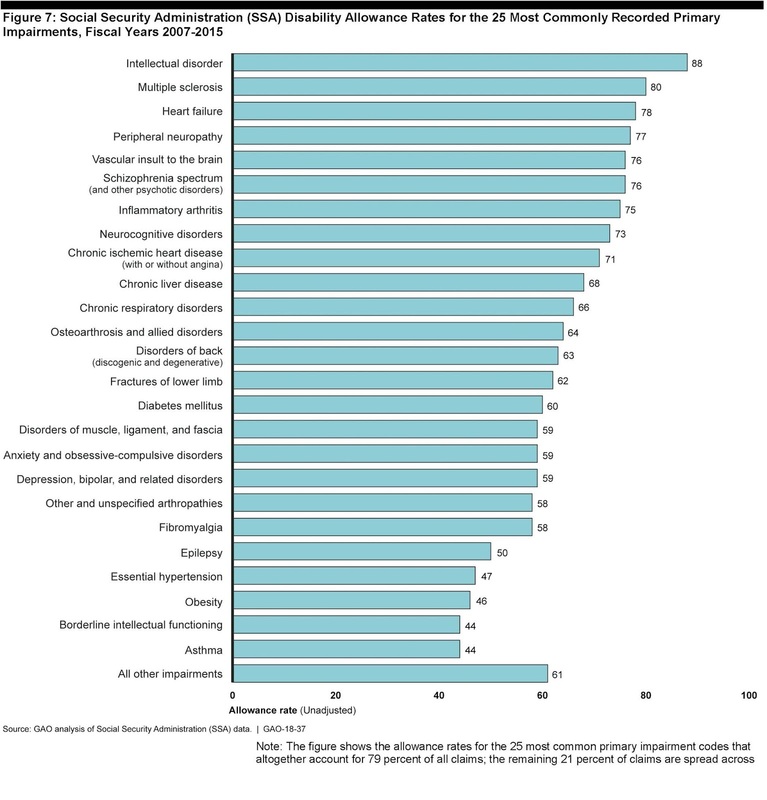 [I]n 2013, among all Medicare beneficiaries, average out-of-pocket health-related expenses consumed 41 percent of the average Social Security income, according to a report made available exclusively to The Washington Post. You might find training materials used recently at the Office of Hearings Operations on "Five Keys to Evaluating Intellectual Disorder" interesting. Half of all baby boomers are now over 62, making them at least potentially eligible for Social Security retirement benefits. 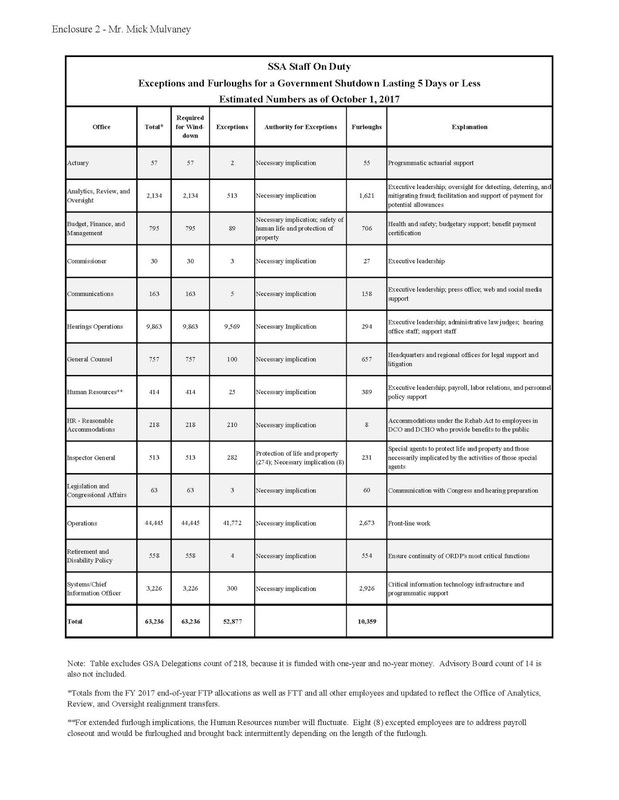 The Social Security Administration submitted proposed changes to its musculoskeletal listings to the Office of Management and Budget (OMB), which is part of the White House, on August 25, 2017. OMB approval is required before the proposal can be published in the Federal Register for public comments. The proposal is still pending at OMB. By the standards of past administrations, this is a very long time for a proposed regulation to sit at OMB. I have no idea what the delay means, if anything. Anyway, it's not like I'm eager for the proposal to be published. I doubt that I'll like it. Given the frequency with which ALJs are employed in administrative proceedings by a variety of federal agencies, see, e.g., 7 C.F.R. 1.144, 1.411(f) (Department of Agriculture); 12 C.F.R. 1081.103 (Consumer Financial Protection Bureau) ; 18 C.F.R. 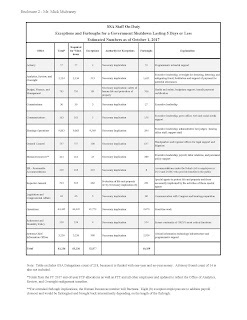 385.102(e), 385.708 (Federal Energy Regulatory Commission); 29 C.F.R. 102.35 (National Labor Relations Board); 40 C.F.R. 22.3(a), 22.4(c) (Environmental Protection Agency), this Court’s resolution of the question presented is necessary to prevent the same disruption that has affected the Commission’s proceedings from spreading through- out the government. Seems like they omitted the name of the agency that employs the vast majority of ALJs, the Social Security Administration (SSA). I doubt that was accidental. Social Security is the rhinoceros in the room that the Solicitor General would prefer that the Supreme Court not notice. This case represents the SEC tail threatening to wag the SSA dog. In reading over this brief, I don't see even the slightest sign that the Solicitor General was trying to lay groundwork to distinguish between ALJs at the SEC, where the Lucia case arose, and ALJs at SSA. Every argument they made applies with the same force to SSA ALJs. The effects upon the SEC if these arguments prevail are trivial in comparison to the effects at SSA. There is an urgent need for at least the Acting Commissioner of Social Security to issue an order appointing each of the current ALJs and ratifying any actions they may have previously taken. The SEC has long since done this. The Department of Labor did it this week. I think it would be far safer if the President were to issue such an order. The Constitution talks only of department heads having the power to appoint inferior officers. SSA isn't a department. Yes, there's a reasonable argument that the framers of the Constitution were using the word "department" in a more generic way than it is currently used in the federal government; that they meant something more like "agency." Maybe the courts will buy that but maybe doesn't seem good enough to me with so much at stake. We need to move to Defcon 1 on this. Oliver Montgomery’s job was to help clients get their Social Security payments. Read more here: http://www.charlotteobserver.com/news/local/crime/article196260704.html#storylink=cpyHe allegedly committed the crimes while on the taxpayers’ dole: Montgomery worked as a service representative in the Charlotte office of the Social Security Administration, the affidavit says. Montgomery’s scheme covered a 12-month period that ended August, during which he allegedly diverted tens of thousands of dollars from two Social Security beneficiaries, the affidavit says. In one of the cases, Montgomery actually assisted his own investigation. After threatening an ex-girlfriend who planned to take him to court over a previous debt, Montgomery shot her a text message with a selfie he’d taken at the Social Security office. In the photograph, Montgomery posed with a large amount of cash, the affidavit says. “Show them that stack on my desk,” he told the former girlfriend in the text. Note to the reporter who wrote this: Being a federal employee doesn't mean that you're "on the taxpayers' dole." That's an insult to the vast majority of government employees who perform their work honorably. Nancy Altman writes for Slate on how Republicans Are Killing Social Security One Tiny Service Cut at a Time. Just two months after finding out he had stage four lung cancer, Dean Lange applied for disability. The treatments forced him to quit his job in the trucking industry. Lange says, "You get what they call chemotherapy brain. It's what the doctors actually call it. You get cloudy, you can't think, it's a vicious thing you know." And while we're at it, why does he fact a two and a half year waiting period for Medicare? The Senate has voted for a new continuing resolution that will reopen the government. I think the bill might have to go back to the House of Representatives for further action and to the President for a signature but those would be formalities. This shutdown is all but over. 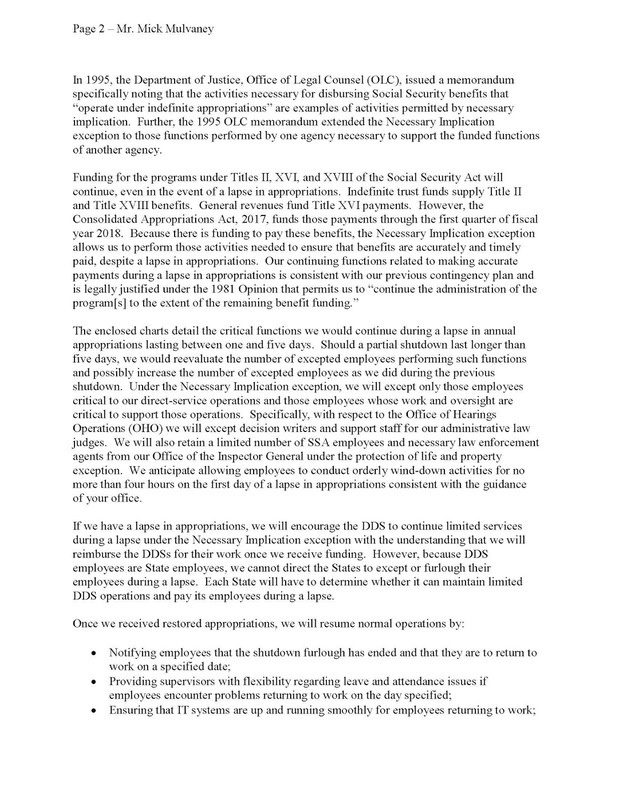 I posted Social Security's shutdown plan on Saturday, the day of the shutdown. Let me post it again. Click on each thumbnail to view full size. By the way, my office called one of Social Security's local field offices today about an attorney fee issue today. It was a situation where the award certificate said the fee was to be one amount but we were paid about $1,000 less. We were trying to find out whether there was some good reason why this happened. 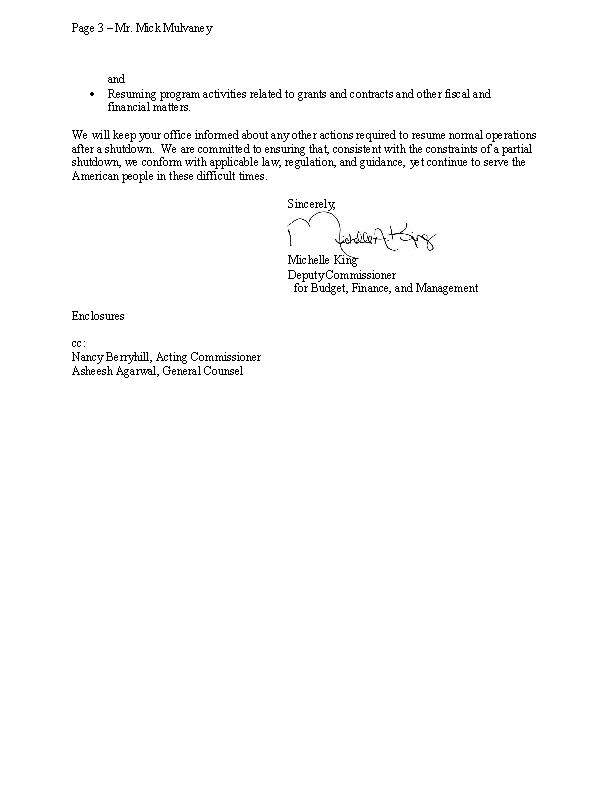 We were told "Sorry, but during the shutdown we're not allowed to discuss attorney fees issues." I don't think that should be accurate. Attorney fees are just part of the process that pays the claimant and those payments are being made. If Social Security failed to pay the attorney properly, there's a good chance they've also failed to pay the claimant properly. Has anyone seen or heard instructions on this or other shutdown issues? Sometimes I upload PDF versions of photos of a part of a client's using Social Security's Electronic Records Express (ERE) system. I do this to demonstrate the client's physical impairment. It might be photos of swollen ankles or severe angulation following a poorly healed bone fracture. In one memorable case, it was astonishingly extreme gout. Photos to demonstrate physical impairments work only if they can be viewed in color. I've seen color PDFs uploaded to ERE stay in color in years past but then that seemed to stop. However, I've recently seen an ERE file that included medical records that had color documents in it that stayed in color. What's the deal? Will color PDFs uploaded to ERE stay in color or not? Is there some special technique to use? Update: A friend provided a link to a section of Social Security's POMS manual which recognizes that some ERE documents need to be in color. It mentions scanning them in color. However, I know I've seen color documents converted to black and white by Social Security's system. In fact, up until last week I don't think I had seen anything in color in ERE for years. Unlike Social Security, the Department of Veterans Affairs will stop processing new claims for benefits during the federal shutdown. I've said it before. Keeping the most visible parts of federal agencies open during federal shutdowns reduces the political costs of shutdowns, making them more likely to happen and longer when they do come. If everything other than prisons, law enforcement and the Military were shut down, we wouldn't have shutdowns. Stop the Treasury from paying contractors and see what happens. Just shut down air traffic control and see what happens. Ms. Sastre is smarter than many of my clients who, even they have endured the delay, worry and frustrations involved in applying for Social Security disability benefits, still believe that there are lots of freeloaders drawing disability benefits. How often do I hear something like "Why can't I get disability. I've got a neighbor down the street and there's nothing wrong with him and he's getting disability?" We're now in a federal government shutdown. Here's Social Security's shutdown plan. Click on each thumbnail to view full size. The two things I notice is that this time almost all of the Office of Hearings Operations (OHO) will stay open but that almost all of the Office of General Counsel (OGC) will shut down. Last time both mostly shut down but were eventually called back in. I'm mostly glad to see OHO stay open. However, there's a part of me that says that ameliorating the effects of a shutdown like this makes the shutdown longer. If virtually the entire federal establishment were actually shut down, the shutdowns would be rare and brief. The OGC shutdown is more of a problem than you might think. Social Security is subject to deadlines in federal court litigation. OGC has enough of a problem meeting these deadlines in the best of times. Federal judges are not as sympathetic to the agency's shutdown problem as you might think. The judges, their staffs and the clerks offices always keep working during these shutdowns. They can't see why OGC would shut down. As many of you are aware, annual funding for the government expires on January 19. 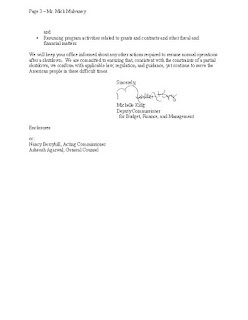 The Executive Branch does not believe it is necessary for a lapse in funding to occur, and looks forward to working with the Congress to finalize appropriations for this year. However, prudent management requires that we be prepared for all contingencies, including the possibility that a lapse could occur. A lapse would mean that a number of government activities would cease due to a lack of appropriated funding, and that a number of employees would be temporarily furloughed. To prepare for this possibility, we are working to update our contingency plans for executing an orderly shutdown of activities that would be affected by a lapse in appropriations. Thank you for your hard work, dedication, and patience through this process, and for all that you do for the Social Security Administration and the American people. The federal government will shut down tonight if Congress cannot agree on a continuing resolution to fund the government. The last time there was a shutdown almost all Social Security employees were told to keep working. 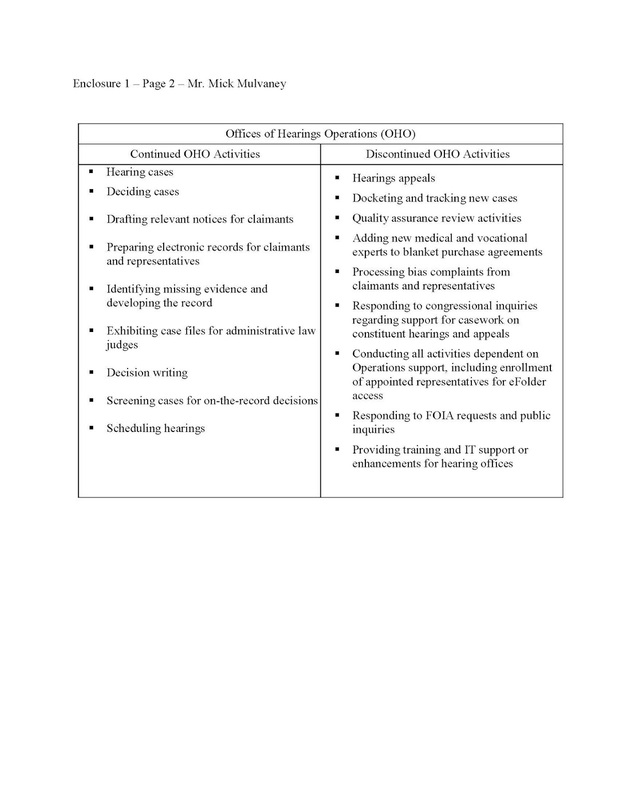 The major exceptions were employees of the Office of Disability Adjudication and Review (now Office of Hearings Operations -- OHO) other than the Administrative Law Judges (ALJs) and most of the Office of General Counsel (OGC). Even without passage of a funding bill almost all the ODAR employees were eventually recalled last time. The OGC employees were recalled just before passage of a continuing resolution. 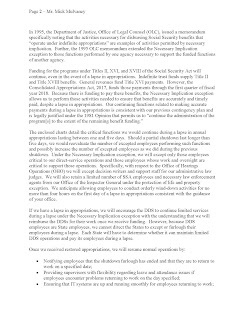 Social Security asked the state Disability Determination Services (DDS) to stay open and they did for a time but some started closing down as the shutdown continued. If you're a Social Security employee, please let me know what you're hearing. My guess is that most of you have no idea whether you're supposed to show up for work Monday and may not find out until Monday morning. By the way, I don't care what your politics are, a shutdown is completely nuts, almost incomprehensible. For the past 12 months, your tax dollars have been going to pay Social Security benefits to a dead man. I know this because that dead man is my late husband. No, I am not engaging in any sort of attempt to defraud the Social Security fund. Quite the contrary, I reported his death to the Social Security Administration immediately after it occurred and have been reporting it repeatedly ever since. 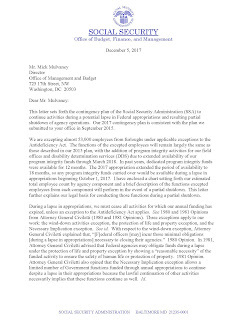 By the way, has anyone ever received a corrected SSA-1099? Is that even theoretically possible? Also, by the way, in her piece Brenhoff eventually veered off into somehow blaming the agency's POMS manual for her problem, which, I guess, helps demonstrate a point that she was trying to make -- that few people understand how Social Security works. Develop strategies to inform the public of resources related to the SSA rep payee program and how to report suspected abuse. Increase oversight of contracted monitoring through the inclusion of measurable performance standards to assess the monitoring process, including the development of quality, timeliness and quantity standards and a method of assessing compliance with those standards. Improve the design of the annual accounting form and monitoring of all rep payee and organizational rep payees with annual reporting requirements. Consider the creation of a shared database for federal benefit-paying agencies and state and local courts that make guardianship decisions. The database will assist in improving financial capability determinations, rep payee selection and oversight of the program. Let me repeat something that I posted late Friday. The Supreme Court has granted a writ of certiorari in Lucia v. SEC, meaning they will hear the case. Lucia concerns whether Administrative Law Judges (ALJs) as presently appointed are constitutional. The Trump Administration is arguing that they aren't. This case may be heard in this term of the Supreme Court, meaning there may be an opinion by the end of June! Let me give a preview of what will happen if the Supreme Court rules that ALJs as presently appointed are unconstitutional. All ALJ hearings must stop. All ALJ decisions must stop. All cases pending at the Appeals Council must be remanded to whatever class of personnel will be hearing cases in the future. All Social Security cases pending in the federal courts must be remanded for new hearings. There is only one way to prevent even some of this chaos. That would be to have the President sign off on appointments for each of Social Security's present ALJs and to do so quickly. That would allow ALJs to continue holding hearings and issuing decisions. It wouldn't do anything about the remands of cases pending at the Appeals Council and the federal courts but there's nothing to be done about that. There have already been presidential appointments for the ALJs at the Securities and Exchange Commission (SEC) where this lawsuit began. All that would be required is for someone to prepare a document saying "I, Donald Trump, hereby appoint the following individuals as ALJs", followed by a list of the ALJs and for Trump to sign the document. Of course, for this to happen, we'd have to have a responsible President, so I'm not expecting it. He [the President] ... shall nominate, and by and with the Advice and Consent of the Senate, shall appoint Ambassadors, other public Ministers and Consuls, Judges of the supreme Court, and all other Officers of the United States, whose Appointments are not herein otherwise provided for, and which shall be established by Law: but the Congress may by Law vest the Appointment of such inferior Officers as they think proper, in the President alone, in the Courts of Law, or in the Heads of Departments. Tho argument is that Social Security ALJs are "inferior Officers" who must be subject to appointment by the President. Social Security, not being a department, has no "head of department" to make the appointment. What makes an employee an "inferior Officer"? How many angels can dance on the head of a pin? I find this lawsuit ridiculous. There's no statute that says that ALJs must not be subject to Presidential appointment. All that would be required to move them from civil service to presidential appointment status would be some changes in regulations at the Office of Personnel Management which the President could easily order. Since there's no obvious test of what makes a position one which must be held by an "inferior Officer", shouldn't the courts defer to the determinations made by Presidents? The President is the one who's supposed to try to make the executive branch work. Why should the courts be second guessing them on this? Even though this is part of the Constitution, it's not like it's enshrining some high principle. If the courts must defer to executive branch interpretations of statutes (the Chevron doctrine), isn't it clear that they should also defer to executive branch determinations of what jobs are and aren't "inferior Officers"? Should the Court find ALJs as presently appointed unconstitutional, aren't they inviting endless lawsuits about the authority of other executive branch employees? Social Security has posted its final numbers on fees paid to attorneys and others for representing Social Security claimants in calendar year 2017. The total was $1.21 billion, up 11% from 2016. Despite the increase, attorney fees are still down from their peak of $1.43 billion in 2010. 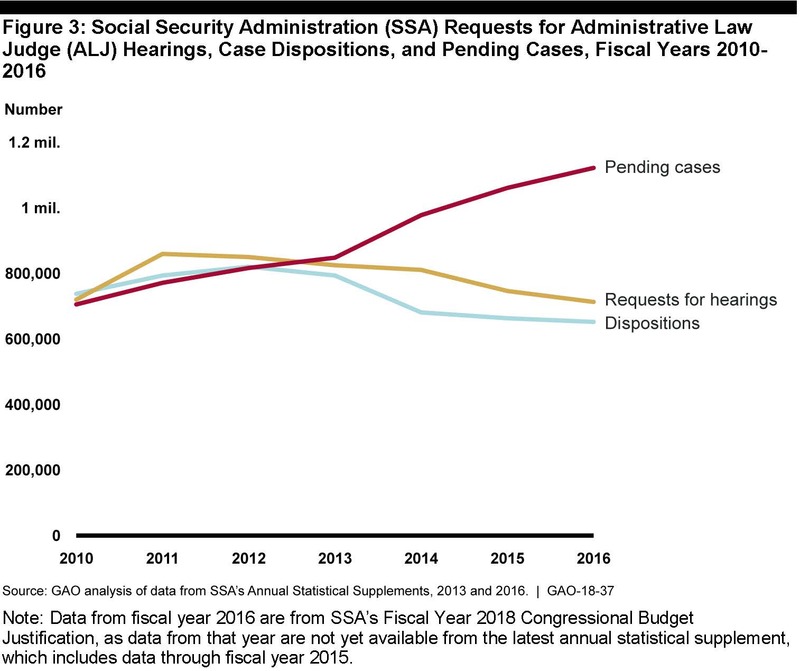 Thing may have been a little less bad last year but all attorneys who practice Social Security law face considerable economic pressure. The attorney fee provisions of the Social Security Act were designed to allow claimants to have representation. This right could be effectively eliminated over coming years unless something changes. One important way that the Acting Commissioner of Social Security could assure that claimants don't lose their right to representation is to increase the cap on Social Security attorney fees. It's currently $6,000. The Social Security Act allows the Acting Commissioner to raise this to adjust for inflation but does not require that she do so. If adjusted for inflation, the cap would now be well over $7,000. It's past time to raise the cap. "Attorneys who represent claimants are lazy. They do nothing for the money they're paid." Those who post this need to ask themselves the question, "If representing Social Security claimants is such easy money, why don't Social Security employees leave their jobs with the agency and jump on this gravy train?" Social Security employs thousands of attorneys but hardly a one of them has left Social Security to represent Social Security claimants in recent years. What does that tell you? "When I was in private practice, I spent hundreds of hours doing depositions and meeting with my client and other witnesses in each individual case. Social Security attorneys don't do anything like that so they're worthless." Those who post this forget that they or their firms were being paid tens if not hundreds of thousands of dollars per case. You try spending hundreds of hours on each Social Security case when the total possible fee is no more than $6,000 and see how long you last! The challenge in representing Social Security claimants is doing a professional job when the economics require you to represent lots of clients. Give it a try and find out for yourself how easy that is. "If you can't make any money, why don't you just quit representing Social Security claimants?" I think this sort of thing is posted by one or more people who work at right wing think tanks or GOP Congressional offices who would prefer that claimants go unrepresented. If you think that Social Security disability benefits (and probably Social Security in general) shouldn't exist, you might be fine with anything that makes it harder for people to obtain benefits. Who cares about being fair to claimants when none of them should be getting benefits anyway? I think this is very much a minority viewpoint. I also think if someone who currently espouses this viewpoint actually becomes disabled, they would quickly change their tune and become indignant if they can't find an attorney to represent them. 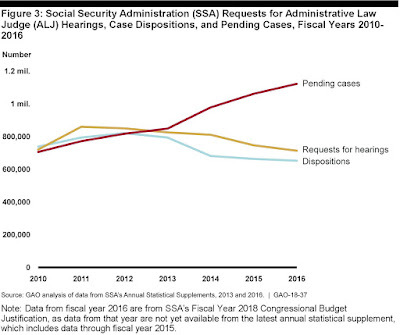 Senator Ron Wyden has penned an op ed on Social Security's hearing backlog. A Social Security attorney told them that claimants should print out the questions that Social Security will ask and decide how they'll answer them. I would say, no, just get on with it. Claimants don't need to be told to do this and that before filing a claim. They're already far too inclined to procrastinate. Persons with limited intellectual capacity who also suffer from mental illness file disability claims all the time with no advance preparation. Just get on with it. Another Social Security attorney recommended gathering your medical records before you apply. Again, this encourages procrastination. The average Social Security disability claimant has no idea how to gather their medical records or what to gather. As an example, it seems like half of my new clients tell me "I've got all my medical records." They're wrong. All they have are the billing sheets they were given when leaving their doctor's office. Those aren't medical records. They're just billing records which don't help in the least. Social Security and your attorney will gather the records. Just get the claim filed and hire an attorney. Almost everything else will be done for you. A third Social Security attorney recommends first getting your doctor on board with your disability claim. I'd rather have that support if possible but it's not essential. I'd say that anywhere from a third to half of my clients don't have that kind of support and I don't care that much. Some doctors think a person has to literally be a quadriplegic or in a persistent vegetative state in order to be disabled. Some think anyone who can't do their past work is disabled. Neither view is correct. Some claimants aren't able to get an opinion because they lack a steady relationship with a physician. Mental illness or poverty often put people in that kind of position. Some physicians tell their patients they'll help with a Social Security disability claim and then don't. I don't care. What's wrong with a person is more important than their physician's opinion. If you tell people they can't win without the help of their physician, you're telling a hell of a lot of very sick people to not file disability claims and that's wrong. In a letter to state Medicaid directors Thursday morning, the Trump administration announced that it would allow states to require Medicaid recipients to participate in a work program or other form of approved “community engagement” in order to retain their health benefits. While there will supposedly be exceptions for disabled people, allowing states to implement the work requirement is a terrible idea. As a disability lawyer and disabled person myself, I know this policy change will be disastrous for my community in a number of important ways. The Supreme Court has granted a writ of certiorari in Lucia v. SEC, meaning they will hear the case. Lucia concerns whether Administrative Law Judges (ALJs) as presently appointed are constitutional. The Trump Administration is arguing that they aren't. I don't know enough about Supreme Court operations to know whether the case will be heard this term or the next. This term would mean a decision this year. Next term would mean a decision next year. Maybe Some Of These Cases Should Be Approved At Lower Levels? 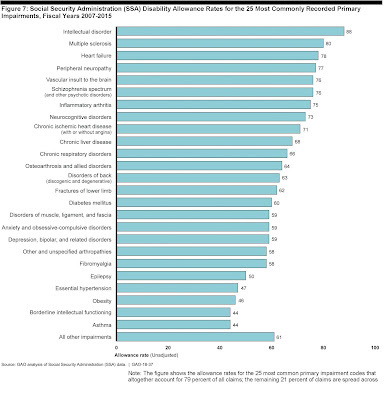 Note the high approval rate in MS cases. I was just talking about MS cases recently. I've also talked about intellectual deficiency cases a lot also. This is rich coming from the Washington Post which has been running article after article portraying disability benefits recipients as shiftless drug-addicted hillbillies. Conn, who is in solitary confinement in the Grayson County jail while awaiting trial on escape and other charges, also called the newspaper from jail. It’s a tale worthy of Conn’s larger-than-life persona, including how he pretended to be engaged to a woman so authorities wouldn’t check his identification while on a bus, and how he says police in Honduras, where he was captured Dec. 2, offered to let him go in return for a bribe he couldn’t cover. Conn said having to look over his shoulder while a fugitive was miserable. If you read this account, it's obvious that Conn had essentially no plan for what he would do after he crossed the border into Mexico. It's a wonder he got as far as he did. Social Security has posted final numbers on disability claims filed and approved in 2017 as well as the number drawing disability benefits. Claims filed decreased by 6% in 2017. This was the seventh straight year of declining claims. There's been a 26% decline in the number of claims filed since the peak in 2010. The number of claims approved actually went up by 2.4% in 2017, the first yearly increase since 2010. Still, the number of claims approved is down 28% from the peak. The number of claimants in current payment status declined by 1.29% in 2017. The termination rate increased to 9.30% which is the highest of any year presented. However, it should be noted that many of those terminations were because claimants had aged off disability benefits and on to retirement benefits. Four Philadelphia-area congressmen sent a letter Monday to the acting chief of the Social Security Administration asking that the agency address the sometimes years-long delays for Philadelphia-area residents seeking disability-benefits hearings. 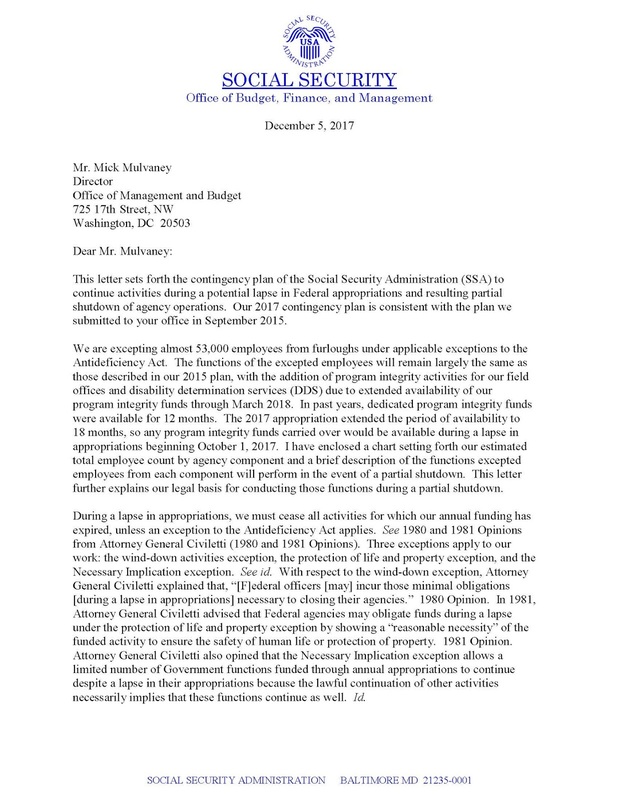 The letter to acting Commissioner Nancy Berryhill, signed by U.S. Reps. Brendan Boyle, Dwight Evans, Robert Brady, and Donald Norcross, all Democrats, came in response to an article in Sunday’s Inquirer that reported that applicants in the city are waiting an average of 26 months for Supplemental Security Income (SSI) appeal hearings. That’s the longest average waiting time for any city in the country. Applicants in adjacent counties in South Jersey and Pennsylvania also are experiencing average wait times of 20 months or longer. Nearly five months after an unprecedented security breach at the credit rating firm Equifax exposed Social Security numbers and other data, making some 147 million Americans vulnerable to potential identity theft and fraud attacks, the Social Security Administration continues to use an identity security system devised by Equifax for the MySocialSecurity online portal. The Social Security Administration has been under enormous pressure to move its operations online. There are Congressional hearings where members of Congress seem incredulous that the agency even has field offices. 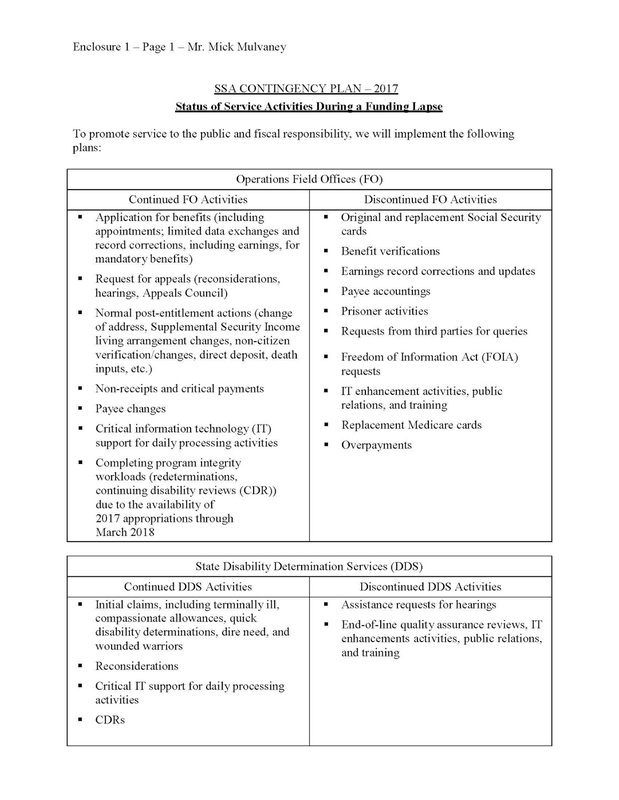 The Government Accountability Office (GAO) keeps pressing to move everything online. If Uber can do it, why can't Social Security? This is based upon a naive belief that Social Security's operations are relatively simple which they might be if the agency only had to take retirement claims. However, many of Social Security's operations -- like disability, survivor and SSI claims -- are way too complicated to be handled online. It's sort of like insisting that a funeral parlor move all its operations online. Sorry, but there's that pesky body you have to deal with somehow as well as bereaved relatives who demandTLC. I can't say whether the authentication process Social Security is using is adequate but I don't know what the alternative would be other than to give up on online services. That would be fine with me as long as Congress gives Social Security adequate resources but that's not going to happen.